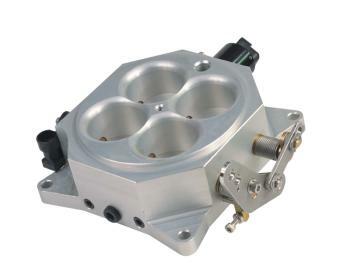 MSD Pro-Billet Throttle Body UNIVERSAL - Dezod Motorsports Inc - Home of the automotive performance enthusiast since 2002. MSD Pro-Billet Throttle BodyProgressive throttle linkage provides smooth transition to wide open throttle. Center dump, anodized throttle blades improve air flow distribution. Continuous, smooth air flow with radius inlets. Low profile design is only two inches tall for improved clearance. Throttle Position Sensor and Idle Air Control motor included. Sure it looks like a trick carburetor, but this Throttle Body doesn’t monitor any fuel – only the delivery of the air flowing into the engine. Air flow into the intake manifold is just as important as the fuel being injected into the engine. The continuous flow of air must meet the demands of rpm in order to create the correct air/fuel ratio to enter the combustion chamber. This new Pro-Billet Throttle Body is designed to produce smooth, stable air flow at any rpm. The entire throttle body begins as a billet of 6061-T6 aluminum and is introduced to a state-of-the-art CNC machine. From here it is precisely machined resulting in overall accuracy to within 0.001”! The air inlets are formed with radiused openings to supply a smooth entrance for the air. The two sets of throttle blades are arranged to open towards the center to keep the airflow equal and continuous. The housing is fit with five vacuum ports and accepts a standard size air cleaner base. The Throttle Body is supplied with an accurate Throttle Position Sensor and Idle Air Control motor. It fits standard four barrel, spread bore intake manifolds.